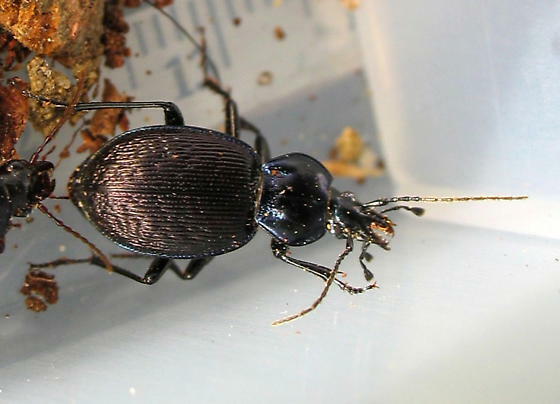 Boat-Backed Ground Beetles are distinctively different in appearance from most common ground beetles. The part of the body region underneath the wing covers is oval, and purple or black in color. Boat-backed beetles (Scaphinotus spp.) live in very moist areas like the woods of New England and all along the east coast of the United States to Florida. They are noted for their habit of feeding on snails and slugs. Snails and slugs are some of the worst pests in a garden. They cause damage to plants by feeding on them. They chew leaves and flowers, and the can clip the stems of small plants, which kills the plant. 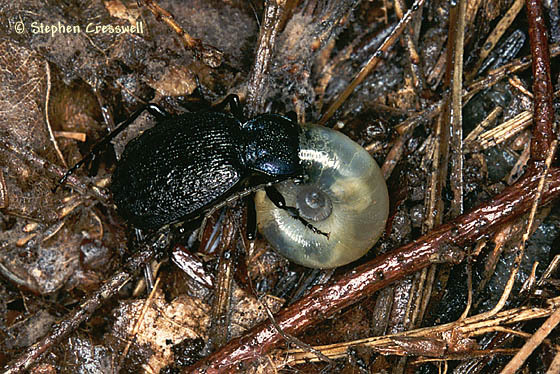 Because Boat Backed Beetles eat slugs and snails in the garden and in the woods, they are considered beneficial bugs. 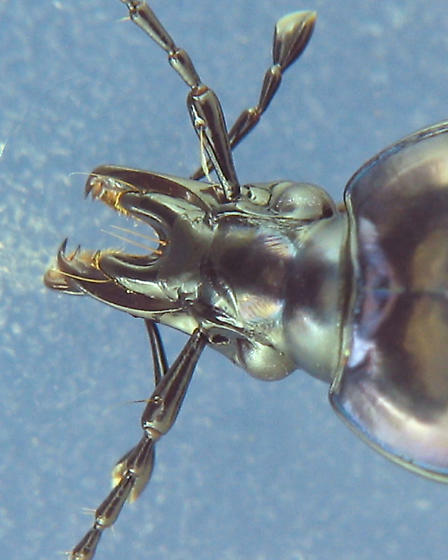 This beetle is very narrow in the front with jaws that can be used to get into snails and eat them. The beetle can reach into a snail's curving shell using its long mandibles (jaws) to seize the animal inside. Stephen Cresswell who took the picture below, found this Boat Backed Beetle on the ground in a pile of old leaves enjoying its meal. In the picture below you can see the beetle's narrow head and mandibles that can be used to reach into a snail's shell and eat the animal inside.